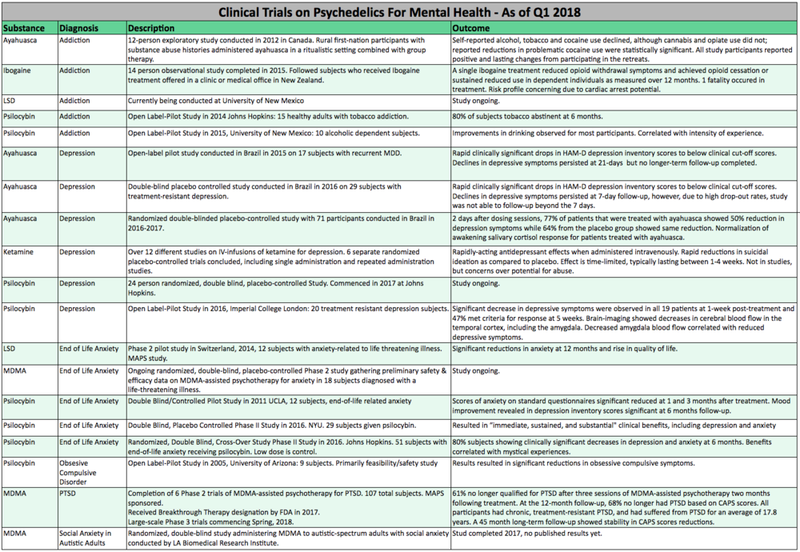 With the incredible amount of public attention being showered upon psychedelic research, and a growing acceptance in mainstream psychiatry, it is a good time to take a step-back and examine the current state of the clinical research as 2018 gets underway. Much has been made of the so-called “psychedelic renaissance,” which has emerged following a 30-year drought in psychedelics research and above-board therapeutic uses. Coupled with a surge in interest in plant medicines like ayahuasca and the recent popularization of micro-dosing psychedelics for both mental health and productivity, its safe to say that psychedelics have again penetrated mainstream consciousness. Its easy to get overly-excited about the current level of awareness and attention on this subject given how taboo it has been in professional and research settings. I remember encountering some of the the negative attitudes about psychedelic therapy when I worked in UCSF’s Psychiatry Department. They varied from “that’s a relic of the past” to “its reckless and dangerous.” Now, 10 years later, UCSF researchers are actually studying psilocybin. Its amazing how shifts in the cultural zeitgeist can radically change how a particular topic is viewed, and even how mainstream science looks at it. However, due to its controversial history and the now 50-year old “war on drugs,” evidence for psychedelic medicine needs to be substantial and impeccable. So where are we today in practical terms? What do we know and what can we prove in terms of psychedelics as therapies for mental health conditions? Based on the current clinical trials of psychedelics and humans with mental health diagnosis, one can really only say two things: its promising and its preliminary. As you can see in the table below every single study has shown significant benefits, and studies have been conducted on problems as varied as Obsessive Compulsive Disorder and Alcoholism. There have been exceedingly few serious adverse outcomes (ibogaine being the exception) and some really significant responses in the hardest to treat areas of mental health, such as treatment-resistant depression and chronic post-traumatic stress disorder (PTSD). However, preliminary is the key word here. In most cases, these are small pilot studies with fewer than 20 participants receiving active treatment. And most of the studies were conducted too recently to demonstrate long-term benefits. However, there are some lines of inquiry that are further along than others. The Multidisciplinary Association of Psychedelic Studies’ (MAPS) herculean effort with MDMA-assisted psychotherapy for PTSD is finally reaching Phase III, with large-scale nationwide multi-site trials beginning this year. That is a significant accomplishment that is based on the back of 17 years of human trials and dedicated work by a crew of committed researchers and organizers, including study leads Michael and Annie Mithoefer and MAPS executive director Rick Doblin. The results from the recently completed 107-participant Phase II trials show that MDMA-assisted psychotherapy is safe and can be a highly effective treatment for chronic and treatment-resistant PTSD. 68% of participants no longer had PTSD at their 12 month follow-up. Follow-up studies showed that these results persisted 4 years later. These results are truly incredible as PTSD is notoriously difficult to treat and there are very few current therapeutic treatments that work. Many people are stuck with debilitating PTSD symptoms their entire lives. The other line of research that has completed FDA-approved Phase II trials is the study of psilocybin as a treatment for cancer-related anxiety and depression conducted at Johns Hopkins and NYU. In both Phase II trials, one with 51 participants and the other with 29, subjects experiencing depression and anxiety related to diagnosis with a life-threatening form of cancer received psilocybin in conjunction with psychotherapy. The results for both studies were quite strong, showing rapid and substantial declines in subjective reports of anxiety and depression as well as improvements in mood and outlook on life and death. This is especially significant since there aren’t any good therapies addressing existential end-of-life-related distress, anxiety, and depression, conditions which are experienced by up to 40% of cancer patients. The incredible documentary, A New Understanding: The Science of Psilocybin, chronicles the personal stories of people with terminal illnesses experiencing profound healing through the use of psilocybin. With the big exception of ibogaine, the studies show pretty clearly that, yes, administering psychedelic substances in a well-monitored psychotherapeutic context is safe. Hundreds of administrations of MDMA and psilocybin have been conducted in rigorously monitored studies in the last 10 years and there have been no reported serious adverse outcomes. Experiences of anxiety or increases in blood pressure that can come-up in the midst of the experience tend to be transitory. Participants also have trained experienced therapists sittings with them during their journeys. These are therapists who have worked closely with the participants and have established trust and a working relationship. The MDMA being used is also not your typical adulterated street Ecstasy. They use pharmaceutical-grade pure MDMA. These studies also rigorously screen-out people with histories of or at high risk for manic episodes or psychosis. 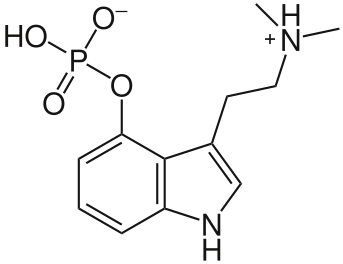 The model has been proven: MDMA and psilocybin in conjunction with psychotherapy can be administered safely and the current evidence suggests that they are very effective therapies. None the less, more study is needed. There are two trials ongoing in the US that are currently recruiting new research participants and may be of wide interest. The first is Johns’ Hopkins study on the effects of psilocybin for major depressive disorder. It is a 24-participant study and is currently underway. 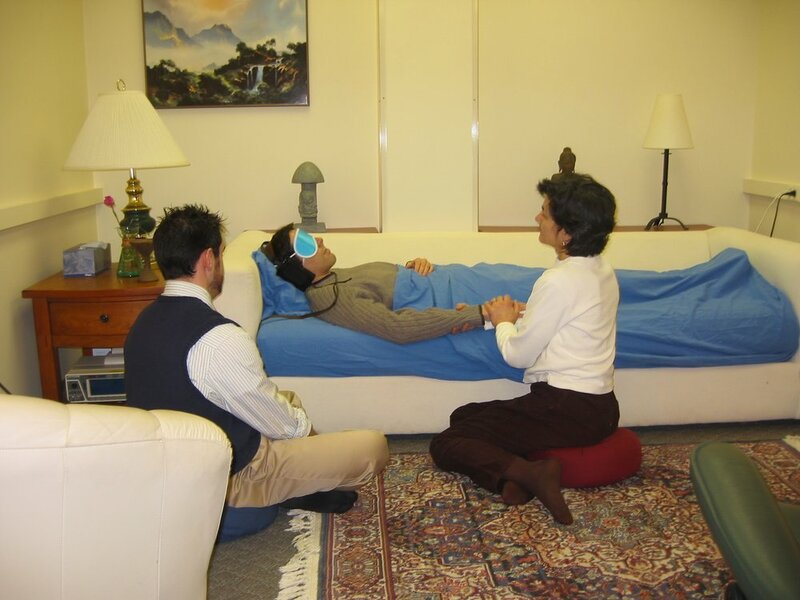 The second is MAPS’ Phase III trial of MDMA-assisted psychotherapy. This is a multi-site study being conducted at locations across the US from New York to California. They are looking to recruit between 200 and 300 participants with severe PTSD. If you live in Europe, Helsinki University is about to start a 60-person study on psilocybin for major depressive disorder. The study is projected to start in September 2018 so they will likely begin recruiting shortly. It is an exciting time for psychedelic research and soon may be an exciting time for legalized psychedelic-assisted psychotherapy. Rick Doblin at MAPS has talked extensively about MAPS’ vision for a network of legal MDMA clinics across the US where clients could receive MDMA-assisted psychotherapy in a safe therapeutic setting. That’s a vision worth supporting. The first step is FDA approval for MDMA as a prescription medicine. He believes that this is possible by 2021. Conducting large-scale clinical trials without corporate funding is expensive. MAPS needs $25 Million to complete the Phase III trials and this is being funded 100% by donation, an unheard of phenomenon in pharmaceutical research. The best way to support psychedelic research and the legalization of psychedelic-assisted therapy is by making a donation to MAPS.